(Phys.org)—A team of researchers affiliated with several institutions in Japan has found evidence showing that condensed aluminum oxide dust surrounding the star W Hydrae plays a key role in accelerating the stellar wind. In their paper published on the open access site Science Advances, the team describes their study of the star and the gases that surround it. As scientists look to the stars to understand the nature of the universe, they also seek answers regarding universal origins. The Big Bang, theory, for example, suggests how things might have started, but what processes led to the creation of atoms, for example? In this new effort, the researchers believe they may have found a source: W Hydrae, a star that is part of the Hydrae constellation and is classified as an asymptotic giant branch (AGB) star—stars that are still evolving and are in the low to medium mass size. W Hydrae has approximately nine times the mass of our sun and is a popular object of study due to its brightness. Scientists have come to believe that the study of AGBs might offer clues regarding how the elements were created. Using the Atacama Large Millimeter/submillimeter Array of telescopes, the researchers observed W Hydrae, one of the brightest stars as seen from Earth. The researchers found evidence of aluminum oxide dust in its outer shell—within three "stellar radii." The presence of the dust, the researchers suggest, might be a driver of stellar wind and perhaps a means of synthesizing atoms. In their theory, the aluminum oxide grows into grains and aggregates in the dust shell. The aggregates move more when struck by light from the star. As they move away from the star, they encounter silicate dust and continue to move away from the star, causing the stellar wind (the continues flow of charged particles emitted from the star) to pick up. As part of this process, atoms such as silicon and oxygen may be formed. They also suggest the process prevents silicate dust from forming efficiently around the star. 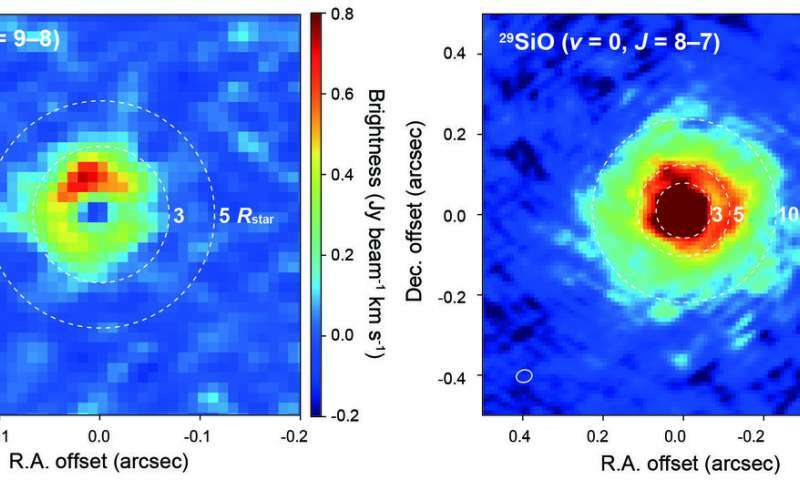 High spatial resolution image of AlO and 29SiO molecules around W Hydrae observed with ALMA. Colors show emissions from AlO molecules (red) and 29SiO molecules and the star (yellow). 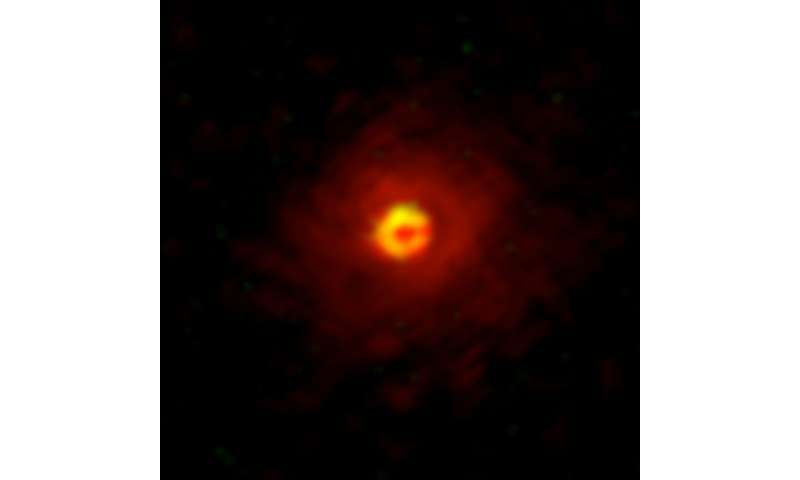 Credit: ALMA (ESO/NAOJ/NRAO), Takigawa et al. Dust grains, formed around asymptotic giant branch (AGB) stars, are accelerated by stellar radiation to drive stellar winds, which supply freshly synthesized nuclides to the Galaxy. Silicate is the dominant dust species in space, but ~40% of oxygen-rich AGB stars are thought to have comparable amounts of aluminum oxide dust. Dust formation and the wind-driving mechanism around these oxygen-rich stars, however, are poorly understood. We report on the spatial distributions of AlO and 29SiO molecules around an aluminum oxide–rich M-type AGB star, W Hydrae, based on observations obtained with the Atacama Large Millimeter/submillimeter Array. AlO molecules were only observed within three stellar radii (Rstar), whereas 29SiO was distributed in the accelerated wind beyond 5 Rstar without significant depletion. 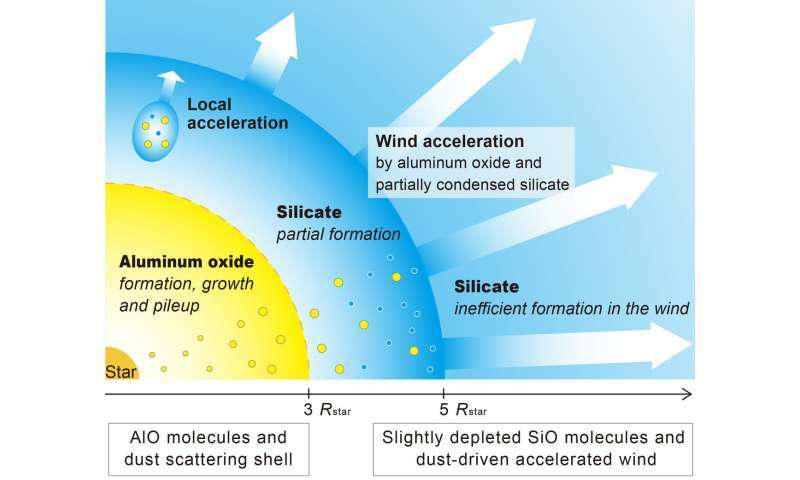 This strongly suggests that condensed aluminum oxide dust plays a key role in accelerating the stellar wind and in preventing the efficient formation of silicate dust around W Hydrae. A much simpler consideration would involve acknowledging an electric field to accelerate the stellar/solar wind.